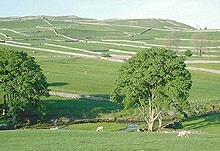 Dales Way Walking Holidays from Mickeldore Travel. The Dales Way crosses through the Yorkshire Dales from east to west, spending much of its time on the riverside paths bordering the Rivers Wharfe and Dee. The path begins in Ilkley, a market town at the eastern edge of the Dales and takes a route through Wharfedale and Dentdale, before crossing into the foothills of the Lake District to finish on the shores of Lake Windermere, England’s largest lake, in the Lake District. This is primarily a riverside walk threaded between market towns and ancient limestone village hamlets. In between, the route takes in shorter sections of moors, fell sides and limestone pavement to keep the route interesting. The Yorkshire Dales is an internationally renowned National Park, with a characteristic landscape of limestone dry stone walls and isolated field barns with small villages and hamlets dotted through the steep sided valleys. 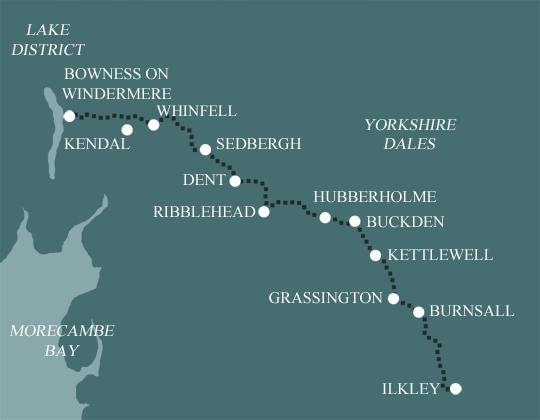 We have three different options for the whole Dales Way route – choose from 6, 7 or 8 days walking. 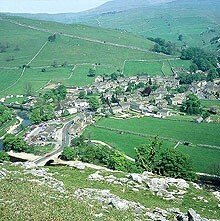 For those with less time, we also offer a 3 day walking option on the Wharfedale section of the route. Click on the links below for more detailed information of each holiday. This is easy walking in classic Yorkshire Dales country. From the beautiful Bolton Abbey, along river sides and through woodlands, meadows and moorlands, to Buckden in Upper Wharfedale.